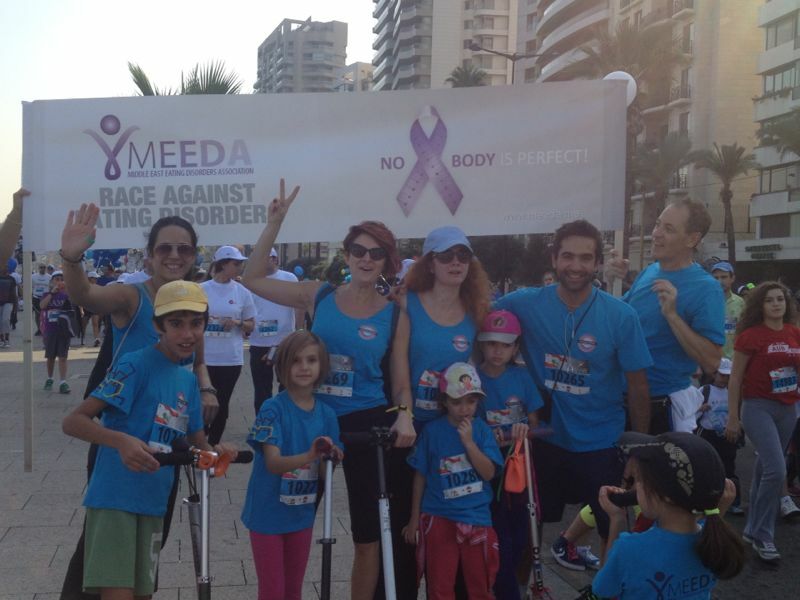 MEEDA, based in Lebanon is a non profit organisation aimed at raising awareness prevention and providing support to those suffering from eating disorders in the region. Founder: Jeremy Alford (PHD) Clinical Psychologist, hypnotherapist and Neurofeedback Therapist who has relocated to Bali (see our Indonesia page). 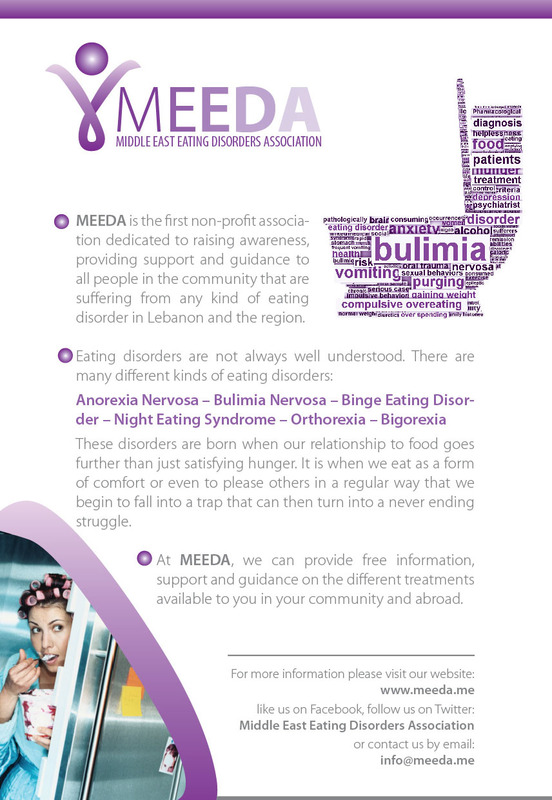 MEEDA hosted the first ever Middle East based training events for health professionals in eating disorders and obesity together with the National Centre for Eating Disorders UK. There are plans to continue this and other ED trainings in Dubai. Contact Carine below for details. 100 brave people ran in the Beirut Marathon in November 2013 to raise funds for professional training, support and treatment. Well done to everyone who finished! MEEDA are always in need of funds to help them bring awareness of eating and weight problems to the region. Contact them if you wish to join or add support. Dr. Najwan Al-Roubaiy is a UK HCPC and UAE HAAD registered clinical psychologist currently working in the UAE at the American Center for Psychiatry & Neurology (ACPN) Abu Dhabi branch. He is also a Chartered member (CPsychol) & Associate Fellow (AFBPsS) of the British Psychological Society (BPS) with more than eleven years of clinical experience in the UK and Sweden. He has a BSc (Hons) in Psychology from the University of East London, an MSc in Counselling Psychology from the London Metropolitan University, the Specialist Qualification in Clinical Psychology from the Swedish Psychological Association, a PhD in Counselling and Psychotherapy from the University of Leicester, & several CPD qualifications such as the NCFED Diploma in practitioner skills for Eating Disorders. Dr. Najwan Al-Roubaiy works with adults & adolescents suffering from a wide range of mental health disorders including eating disorders. Carole has been taking care of multi-national families in cosmopolitan Dubai since 1998. She is a medical doctor trained to work with eating disorders & she believes in evidence based medicine & psychotherapy, influenced of course by patient-informed decisions & needs. She has wide experience of all common medical disorders & mental health issues, in particular body image & weight concerns, which has led to her gain specialist qualifications in working with eating disorders. She works as part of a specialist eating disorder team alongside a psychologist & a nutritionist. Carole works with children, adolescents and adults. Carine is a clinical psychologist/ psychotherapist specialising in eating disorders & addictions, first at the General Medical Centre in Dubai then as part of the eating disorders outpatient service at the American Centre for Psychiatry & Neurology. She is the Chief Operations Office for MEEDA (The Middle East Eating Disorders Association) – running Awareness workshops around the U.A.E in schools, universities & medical clinics. Carine uses ACT (Acceptance & Commitment Therapy) & EMDR (Eye Movement Desentization & Reprocessing) – a leading method for treating trauma, which she integrates with her psychotherapy training to provide a holistic approach for all mental health disorders including depression, anxiety & trauma. Carine has a Masters in Clinical & Psychopathological Pathology from Lebanon, a Diploma in Clinical Psychology from France & The Eating Disorder Practitioner Diploma from NCFED, UK. Carla is a CBT/Schema Therapist with many years’ professional experience. Qualifying in psychology at McGill University, Montreal, she has an Advanced Diploma in Hypnotherapy from the London College of Clinical Hypnosis, a Masters in REBT from Goldsmiths University, London,; an Advanced Diploma in Schema Therapy from the USA & the NCFED Practitioner Diploma in Eating Disorders. She worked in the UK in private practice, Harley Street, as well as at the Priory, Roehampton, before moving to Beirut in 2011 where she became Head of Psychotherapy at Belleview Medical Center & where she also has her private clinic. Carla sees adolescents, adults & couples for a wide variety of issues, including eating disorders. Sandra brings 25+ years of professional experience, including an extensive background in social work, psychology & trauma. Her educational achievements include an Masters in Psychology & Social Administration, a post graduate Diploma in Applied Social Studies & Certificate of Qualification in Social Work. 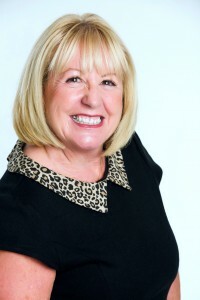 She has gained further qualifications in Traumatic Stress, Traumatic Incident Reduction (TIR), Clinical Hypnotherapy, Transpersonal Regression Therapy, Emotional Freedom Technique (EFT), CBT, Observed & Experiential Integration (OEI) Therapy (a neurological approach to trauma) & The Eating Disorder Practitioner Diploma from NCFED, UK. Sandra is now working in private practice under the licence of Personal Development Solutions. Maria is a licensed clinical dietician, with a Bachelor of Science in Nutrition & Dietetics. from the AUB. She now works in a nutrition centre in the UAE, counseling a wide range of clients, helping them make positive changes to their lifestyle & diet . Her main interests are eating disorders, weight management, adolescent & sports nutrition. As she believes in the multi-disciplinary approach to ensure maximum benefit to her patients, Maria works closely with a team of medical doctors, psychologists & dieticians. Complimenting her one-on-one counseling, Maria shares her passion for & expertise in the field of dietetics & nutrition by actively being involved within the community, conducting numerous workshops at schools & corporations emphasizing the importance of healthy eating habits / active lifestyles. Maria holds The Eating Disorder Practitioner Diploma from NCFED, UK. Jelena is an experienced Gestalt Therapist and Psychologist working in private practice. She is passionate about helping women & men to overcome their difficulties with eating, weight & body image issues & to lead happier more fulfilling lives. She has experience with different cultures & has worked with depression, anxiety, eating disorders & compulsive eating, as well as trauma, loss & bereavement. She holds a Ph.D. in Biomedicine & Health Sciences and the Master Practitioner award in Eating Disorders & Obesity from NCFED, UK. Dr Melissa is a clinical registered nutritionist with a PhD in cognitive neuroscience & special qualifications in eating disorders. She is also trained to work with sports nutrition & physiology. As well as being an Assistant Professor at the Lebanese University, she has a private clinic which focuses on helping people overcome their eating disorder & all the harmful behaviours associated with it. Melissa is on the Advisory Board of MEEDA & works alongside her colleagues across the Middle East who have similar interests & passions to help people recover. Office: Beirut Lebanon, please ask Melissa for details. Office: New Jdeideh, Centre Zeidan 1st Floor Beirut Lebanon.